Since 1986 Saint Anthony’s Community Center has been administering the City Fare Senior Nutrition Program, targeted to provide hot, nutritious meals to low-income senior citizens. Our goal is to promote the health, independence and quality of life of the seniors we feed everyday. City Fare serves nearly 500 noontime meals each weekday at thirty-two senior centers and senior housing complexes throughout New Castle County. We also deliver Meals on Wheels throughout New Castle County to about 700 seniors who are no longer able to leave their homes. For some homebound seniors, the volunteer or staff member who delivers the meal is the only person they will see all day. In addition to meals, City Fare provides a daily check-in to see that our clients are alive and well. It is only with the support of volunteers that we are able to accomplish our mission. Our volunteer force is 1,500 people strong and our Volunteer Coordinator schedules about 60 people each day at lunchtime to deliver meals. We are fortunate to have this support and are grateful to the businesses, churches, civic groups and individuals that give their time and their wheels to feed our homebound seniors. The collective value of our volunteers’ service exceeds $250,000 each year. 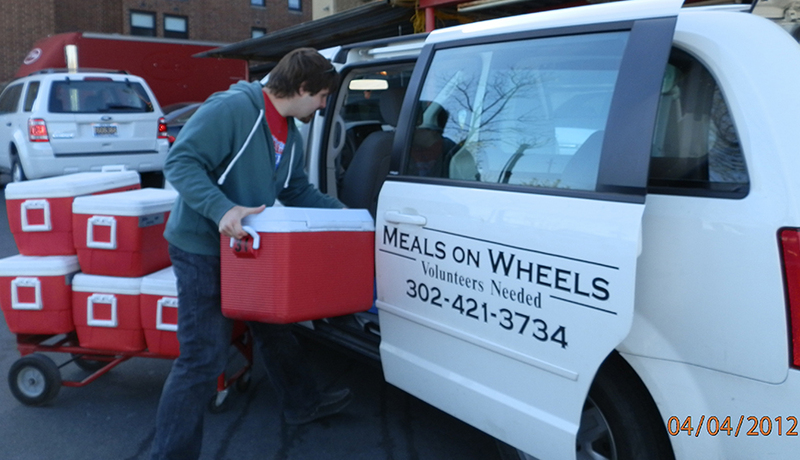 Leveraging our volunteer power allows us to decrease our costs and allocate our funding to the meals. We absolutely would not be able to serve as many meals as we do without the support of the community. The program receives funding from the federal and state government through Title III of the Older Americans Act, voluntary donations from our clients, grants from the Kenny Family Foundation and Meals on Wheels Delaware and tax-deductible charitable donations from individuals. Please visit our website to refer a senior for meal delivery, learn more about volunteering or to make a donation.